Explanation: Why isn't this ant a big sphere? 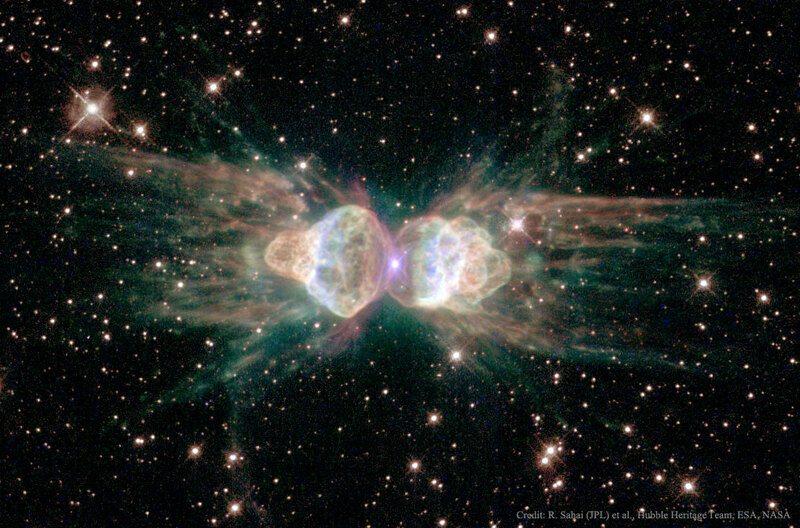 Planetary nebula Mz3 is being cast off by a star similar to our Sun that is, surely, round. Why then would the gas that is streaming away create an ant-shaped nebula that is distinctly not round? Clues might include the high 1000-kilometre per second speed of the expelled gas, the light-year long length of the structure, and the magnetism of the star visible above at the nebula's centre. One possible answer is that Mz3 is hiding a second, dimmer star that orbits close in to the bright star. A competing hypothesis holds that the central star's own spin and magnetic field are channeling the gas. Since the central star appears to be so similar to our own Sun, astronomers hope that increased understanding of the history of this giant space ant can provide useful insight into the likely future of our own Sun and Earth.